From delivering quality care and controlling costs to navigating policy changes and new technologies, healthcare managers face myriad challenges. Earning a Ph.D. in healthcare management online is a flexible, affordable way to acquire the advanced skills and knowledge needed to excel in lucrative, high-level positions. According to the U.S. Bureau of Labor Statistics, growing demand for qualified candidates has led to a projected 20% increase in medical and health service management jobs, with a median salary of $98,350. Earning a DHA degree online is a valuable investment in your future career. 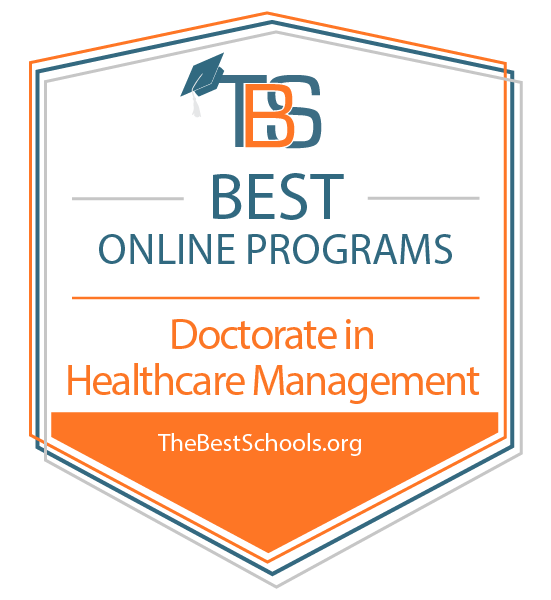 Online Doctorate in Healthcare Management Degree Program Ranking Guidelines: We selected the degree programs based on the quality of program and range of courses provided, as well as school awards, rankings, and reputation. With its home campus in Mount Pleasant, CMU places an emphasis on healthcare programs. The university supplies Michigan with new primary care physicians, attempting to solve a shortage issue in the state. Of the thousands of students who attend classes on campus in Mount Pleasant, around 20% of supplement with online courses. CMU also offers a number of online and hybrid programs, including a doctorate in healthcare management. CMU's doctor of health administration program requires 63 credits to complete. Students follow a set path of 15 online courses in a cohort. The program also includes six face-to-face seminars that take place over the course of two-day periods at regional locations. Central Michigan University is regionally accredited by the Higher Learning Commission. Franklin University serves adults in the Midwest who seek online or on-campus programs. Franklin offers degree options designed to allow flexibility for working adults, including a doctoral degree in healthcare management. Earning this flexible degree online requires 58 required semester hours and takes about three years to complete. Students may transfer up to 24 hours of earned credit towards this degree, allowing them to complete the program even faster. The program includes 16 hours of research coursework and 20 hours within the major area of healthcare administration. Students may also take advantage of Franklin's option to "jumpstart" their dissertation and complete this requirement in just one year after the required coursework. An evangelical liberal arts college in Lynchburg, Virginia, Liberty University serves more than 100,000 students online and on campus. Liberty's academic programs feature curricula designed to emphasize a Christ-centered education. Liberty offers an online doctorate in business administration with a specialization in healthcare management. The 60-credit program generally takes around three-and-a-half years to complete. Students can transfer up to 15 hours of earned credit towards this degree. The 60 required credits include online coursework with optional intensive face-to-face courses. Coursework in the program emphasizes the legal and ethical aspects of healthcare management and an exploration of global healthcare systems. Located in Charleston, MUSC provides the state's only academic health science center. The university serves over 3,000 students and 700 graduate and professional residents, with students earning degrees in six unique colleges: Dental Medicine, Graduate Studies, Health Professions, Medicine, Nursing, and Pharmacy. Students can earn their doctor of health administration degree online at MUSC in just three years through a combination of asynchronous online courses and short intensive face-to-face seminars. The program consists of 54 required semester hours, including 36 hours of coursework and 18 hours for a doctoral project. Applicants must have at least five years of experience in a management position in the healthcare field and a professional or master's degree in a related field. Many graduates of the program go on to teach at the university level. MUSC is regionally accredited by the Accreditation Council for Continuing Medical Education. Referred to as Ole Miss by students and alumni, the University of Mississippi houses the state's only academic health center at the University of Mississippi Medical Center. The Medical Center offers a doctorate in health administration with both online coursework and face-to-face requirements. Students generally complete this program in about three years. Cohorts of 10-15 students enter the program each year and complete work together on similar timelines. Students generally cannot transfer previously earned doctoral credit, though the college may consider some exceptions. The University of Mississippi is regionally accredited by the Southern Association of Colleges and Schools Commission on Colleges. The curriculum for a doctorate in healthcare management strengthens administrative skills in multiple areas, including human resources, finance, and marketing. Students who pursue a doctoral degree in healthcare management also obtain valuable research and analytical skills applicable to many roles and disciplines. Core classes often introduce advanced concepts in microeconomics, cost-benefit analysis, statistics, health policy research, and financial management. In addition, some programs offer concentrated academic paths in areas like recruiting, economic health policy, and quality assurance. Concentrations allow students to personalize their curriculum according to their interests and professional goals. Most doctoral candidates are expected to complete and defend a dissertation before graduating. On average, full-time learners take at least three years to complete their doctorate in healthcare management, while part-time students may require additional time. Pursuing a Ph.D. in healthcare management online allows you to directly apply healthcare leadership theory to your current job, and many candidates choose to remain employed as they study part time. Many programs prefer to admit applicants with significant work experience, and prospective students are usually expected to provide several professional references along with scholarly writing samples, undergraduate and graduate transcripts, and GRE or GMAT scores. Most doctorate in healthcare management curricula consist of 60 credits, although this number varies according to school, focus area, and graduation requirements. While every curriculum is unique, most schools require all healthcare management doctoral students to complete core courses in policy, leadership, and economics. Most programs include one or more of the following classes. Lectures survey the complex regulations and laws surrounding healthcare delivery and payment models, from historical developments and healthcare reform to current policy. Students explore the economic and political implications of healthcare legislation and reform. Healthcare agencies must continue to meet certain quality standards from both government regulatory agencies and nonprofit accrediting agencies. In this course, candidates learn to gather data and complete the assessments required for licensure and accreditation. Healthcare providers often find themselves facing ethical dilemmas with complex legal implications. This course covers patient privacy issues, client rights, and balancing patient interests with obligations to third-party payers. Often involving hundreds of medical professionals and support staff, healthcare settings create unique communication challenges. This course discusses collaborative practice, knowledge management, mediation and negotiation, and public relations. This course introduces analytical techniques used to evaluate market issues, trends, and healthcare delivery. Learners examine the impact of emerging technologies on patient safety and cost as they survey economical and quality improvement issues. A doctorate in healthcare management opens up a wide variety of career possibilities, including management-level positions. Ph.D.-holders understand complex healthcare delivery systems and know how to provide quality care while maintaining profitability. The following examples are only three of the exciting and lucrative roles available to graduates. These professionals lead organizations such as private practices or departments, serve as nursing facility administrators, or specialize in health records management. Responsibilities include planning and coordinating health services, recruiting medical personnel, and implementing changes to comply with new legislation or regulatory requirements. A CEO is responsible for overseeing operations within a healthcare facility or organization. While some manage local hospitals and smaller clinics, others work for large healthcare companies that serve multiple hospitals in several states. CEOs must be well versed in finance and business, current healthcare policy, management, and public relations. They often serve as their organization's spokesperson, and must present information to a board of directors or shareholders. Human resources managers lead their organization's recruiting efforts, enforce compliance with state and federal employment laws, and ensure that all employees receive and maintain proper licensure. They investigate complaints and manage employee records while adhering to privacy laws and company policies.